Systems designed to operate from solar power need as a minimum a solar panel and a battery. The solar panel will charge the battery during periods of daylight and the battery will continue to provide power at night. However, without a controller there is a high probability that the battery would be damaged by overcharging during periods of strong sunlight. Furthermore the battery will discharge through the solar panel at night. Finally, if the battery is disconnected the solar panel output voltage can rise significantly and damage the load. 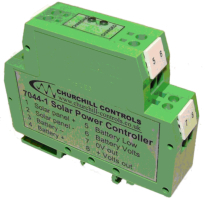 A solar controller is therefore needed to regulate the battery. Most of these are designed for high power systems, and draw a significant current. Although this is not relevant if large panels are used, many monitoring systems only require a small amount of power, so can be driven from small solar panels and batteries. In some cases a commercially-available controller will consume more power than the load, necessitating large panels than would otherwise be needed.